Samantha’s been pretty busy lately, but I finally had a chance to sit her down and get a music suggestion for the wood shop this week. 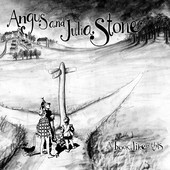 Angus and Julia Stone are a brother-sister folk-blues duo hailing from Australia. And unlike typical siblings, they don’t mind letting the other take the lead on their own songs while the other backs them up. Who needs sibling rivalry when you sound this good together? Of the two voices, I tend to lean more toward Angus’ over Julia’s. There’s nothing wrong with her’s, she simply has this voice I’ve never heard before. But I’m still on the fence about it all…as I’ve only been listening to them for a short while. As for the music backing up those voices, their sound consists very much of soft drums, guitar picking and good old harmonies that leads the listener to a toe tapping good listen. I’m still pretty new to them, but I’m loving what I’m hearing so far.